Easy isn’t really a part of the definition when you’re thinking about limits. Or looking at limitations that might affect the way you live. But I’ve come to see there is an easier side to limitations. I’ve at least grown used to my own limits over the years. Maybe that is one piece of the puzzle. Time. Time to accept something and move past the obstacle-ness of the limit. The easy side of limitations is learning to be thankful. That’s the bottom line. It extends to being thankful for your strengths, those things you can do, even when your limits are still there. We can’t erase some of our limits. We might wish them away. Mostly we can learn to live with them…and to live WELL. You might have already heard or read that I was born with a physical disability. Of course this has shaped my everyday life. It has helped me to be so much more thankful for the big and the small. I was afraid to have back surgery in 3rd grade, but glad to get it over with. I celebrated the day I could throw away the splints I wore every night for years. I couldn’t stop smiling when I “graduated” from high school and physical therapy. I got excited about figuring out how to hold my phone and take a photo of the sky and my favorite bush beginning to bloom. Forsythia. 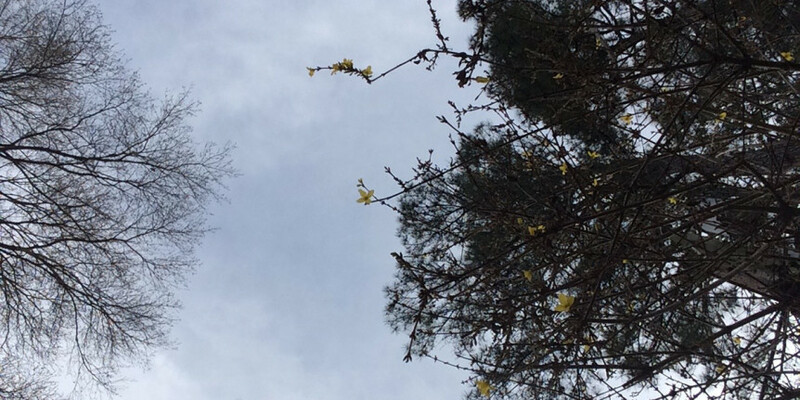 That bright yellow flower points to the coming of spring and a kind of awakening once again. I did something by myself. I drove my chair back in the house and happily showed the photos to my mom. I’m linking up with the Five Minute Friday blogging community. This week the word was “easy”. My new blog series begins on Tuesday, too. Come back for part one of “Breaking Through Barriers”. Feel free to jump in the private Beyond Your Limits Facebook group, where you can meet others, have direct access to me, and enter the dialogue of overcoming limitations and living well.